Looking to brighten dull skin, lighten sun spots and pigmentation and fade acne scars? Do you also want to fight the signs of premature ageing and plump up your skin? Our Brighten & Tighten FaceIt Box contains Korean skin care products to help you achieve your skin goals. Say goodbye to wrinkles and sun damage and hello to youthful, brighter, firmer skin! *When Vitamin C & Vitamin E are used together, the brightening and anti-ageing effects of the ingredients are largely enhanced. Klairs Freshly Juiced Vitamin products are best used together at night. The By Wishtrend sheet mask also contains both Vitamin C & Vitamin E.
Face your pigmentation, dull / tired skin, acne scarring and wrinkle problems with our specially curated Brighten & Tighten Box Set. This set includes a Vitamin C Serum that will target acne scarring, sun spots and dullness to result in brighter, revitalised skin. A Vitamin E Mask that can also be used as a daily moisturiser (apply small amount only) to protect your skin against free radicals and deliver ample moisture and hydration, effectively slowing down the ageing process. A sheet mask that contains Green Tea, 11% Vitamin C and 10.5% Vitamin E to enhance the strength, vitality and brightness of your face and another sheet mask containing Collagen to leave your skin firm and plump. Klairs Freshly Juiced Vitamin Drop is a mild Vitamin C Serum that is gentle enough to use every night. If you wish to use this daily, start slow first with 2-3 times / week then gradually build up to every night. Allow the product to sit on your skin for a couple of minutes before applying the Klairs Freshly Juiced Vitamin E Mask. Klairs Freshly Juiced Vitamin E Mask can be used as a daily moisturiser (use a very small amount as too much product can be a bit sticky) or as an overnight mask 1-2 times per week (use slightly more product). Optional: use as a wash off mask by applying a thicker layer and leaving for 10-15 minutes. 1-2 times per week. By Wishtrend Natural Vitamin 21.5 Enhancing Sheet Mask can be used 1-2 times per week. Pat the remaining essence into your skin and allow it to fully absorb. No need to rinse your face with water. 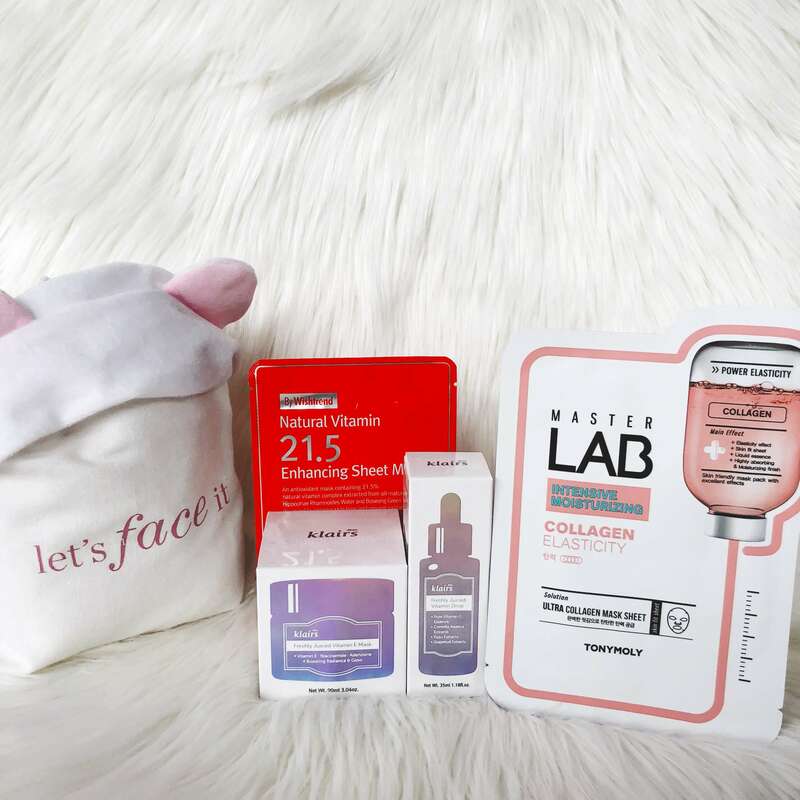 Tony Moly Master Lab Mask Sheet – Collagen can be used 1-3 times per week for maximum plumpness. Let’s Face It Spa Bath Headband is used to keep your hair out of the way when you’re masking & relaxing! Let’s Face It Drawstring Pouch is a reusable cotton bag that you can put your toiletries, makeup or anything you like in and easily carry around with you.